Don and I both love pizza. He has always been the pizza chef in this household. For many years I would just scrape off and eat the toppings and sauce while leaving the crust. And sometimes I succumbed to temptation and ate the crust; even after peeling it off. Much education later I finally realized how destructive gluten was to my system. It wasn’t just a couple of days of discomfort; there was lasting damage from small exposures. We tried to find a gluten-free pizza crust that both of us could/would eat. That was Pizza Crust I. Somehow I could not justify a double pizza crust that required a half dozen eggs. We moved on to equal but separate pizzas. He makes a crust, I make a crust. Then he adds toppings, bakes the pizzas, and dinner is served. My gluten-free pizza crust is now on version V. Eggs were eliminated and replaced by chia seed. Yeast was eliminated and replaced by baking powder. In this version all vestiges of the grass family (of the genus Poaceae) were eliminated and that includes any form of cane sugar – sugar cane is after all, a grass plant. The small amount of sugar was replaced by agave syrup. It helps with browning as well as flavor; sugar is not solely to make the yeast happy. I have included several columns of my ‘pizza crust spreadsheet’ to illustrate the gradual recipe changes. The changes made in each version are bolded. Measure out the dry ingredients and whisk together until thoroughly blended. Make a well in the flour for adding the wet ingredients. Stir the water, olive oil and agave syrup into the flour mixture and work it with a spoon until all of the flour is absorbed. It should form a sticky ball of dough that begins to hold together. Dump the dough on a bread board or clean counter top and knead it with your hands for about a minute. Spray or oil a 12” pizza pan. Flatten the dough and place it on the pan. Press all around until the crust is as even as possible. Form a raised rim around the edge of the crust to help contain the toppings. This step is so much like working with clay in art class. If there are cracks just pinch it back together and try again. Gluten free dough will not toughen up from handling it. Sometimes a it helps to oil a spoon and use the back to push the dough around and form an edge to contain the toppings. Bake the crust for 6-7 minutes at 425* F. Remove it from the oven. Add sauce, grilled onions, mushrooms, olives and optional other ingredients. Cheese may be added if dairy is not a problem. Bake an additional 10-15 minutes until the edges are brown and the toppings are hot. A crust made with buckwheat flour is significantly darker than other versions. It may looked burnt in the picture but it is really just perfect with a firm base and a crispy edge. When Don puts the pizzas together there is ground turkey and cheese in the toppings. I am working on one with a pesto base and lots of sautéed veggies for toppings. Summer produce is looking good for that kind of experimenting. Now that the family has been enjoying gluten free pizza for several months I began trying different crust recipes since our original favorite contained three eggs for a single pizza crust. This one is quite tasty with simple ingredients (if you don’t count making your own flour blend as you work), and easy to put together. Yeast provides the flavor you expect in a pizza crust, the xanthan provides structure, and the baking powder insures that even if your water was too hot and killed the yeast that your crust will rise a bit and have a nice texture. The salt is a yeast inhibitor and also for taste. If you need to leave out the salt you should be OK with the yeast since the crust goes immediately into the oven. I baked salt free bread some years ago and found that yeast can expand at an alarming rate and run the bread dough over and out of the pan while you watch in horror. Sift all together until thoroughly blended. Mix all of the dry ingredients in a bowl. Heat the water (you should still be able to put your fingers in it without pain) and add the oil. Stir the water/oil mixture into the flour mixture and work it with a spoon until all of the flour is absorbed and it all holds together as you work it. Dump the dough on a bread board or clean counter top and knead it with your hands for about a minute. Grease a 12” pizza pan. Flatten the dough and place it on the pan. Press all around until the crust is as even as possible. Form a raised rim around the edge of the crust to help contain the toppings. This step is so much like working with clay in art class. If there are cracks just pinch it back together and try again. Gluten free dough will not toughen up from handling it. Bake the crust for 10-12 minutes at 425* F. Remove it from the oven. Add sauce, grilled onions, mushrooms, olives and optional other ingredients. Cheese may be added if dairy is not a problem. Bake an additional 10-15 minutes until the edges are brown and the toppings are hot. You need a really good pizza sauce for your homemade pizza and this one is easy, it tastes better than the one we bought in a jar from the store – and it was much less expensive! Combine all of the ingredients in a saucepan and place on the stove over low heat. When the sauce begins to simmer just turn off the heat and leave it alone for a couple of hours for the flavors to meld. You can use it immediately or store in the refrigerator until needed. It keeps very well for several days. Pizza was one of the foods that Rita thought she might never experience again without serious concerns regarding a possible Candida flare up. Web research turned up many versions of pizza crust made with baking powder – most of them are labeled Crazy Crust Pizza. We have gluten-free baking powder in the pantry as well as the ever increasing assortment of gluten-free flours so the experiment began. Once again my dear husband was roped in as taste-tester. He is known within the family for his pizza creations so I knew that if he liked it then we had a real winner. How many variations can/should there be for a simple pizza? That seems to vary directly with the number of participants. Rita insisted on ground bison for its grass-fed antibiotic-free lean goodness and we were all in agreement with that. She also wanted grilled onions and we were good with that. I wanted mushrooms and no one else agreed. Rita needed dairy-free but two of us insist on cheese. Fortunately we all know geometry and so boundaries were established on the surface of the crust. 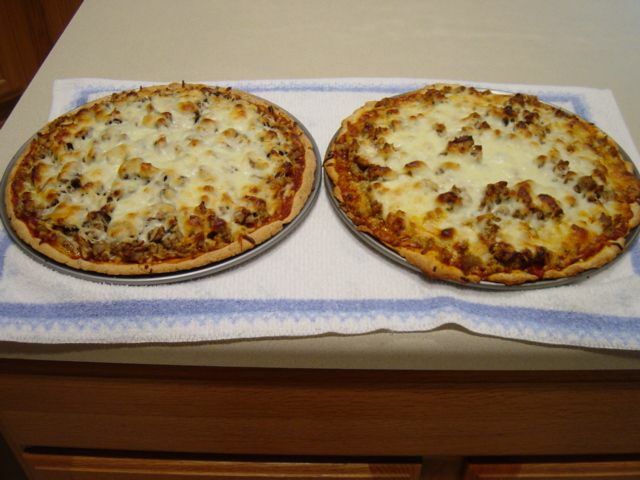 The original recipe advises distributing your browned ground meat on the crust before the first trip into the oven. We have tried it both ways with equally good results. It is perhaps a little easier to eat with the meat firmly in the crust. In the meantime this is Pizza Crust I – Pizza Crust II experiments will begin soon to reduce or eliminate whole eggs for those of us who monitor cholesterol intake. Mix flour, eggs and water in a bowl. Beat 2 to 3 minutes with a hand-held mixer. The batter becomes very light and increases in volume! Grease baking sheet; pour crust mixture onto sheet. Bake the crust for 25 minutes at 425* F. Remove it from the oven. Add sauce, grilled onions, mushrooms, olives and optional other ingredients. Cheese may be added if dairy is not a problem. Bake an additional 10 minutes.